E. Dormy 3D Figures, please feel free to use, with acknowledgements. Contact me by email should you have any question. You will find my current email in my latest article (see Publications). Description: Rotating thermal convection in a spherical shell at a Taylor number of 108 (E=10-4), with a uniform distribution of heat sources in the fluid. 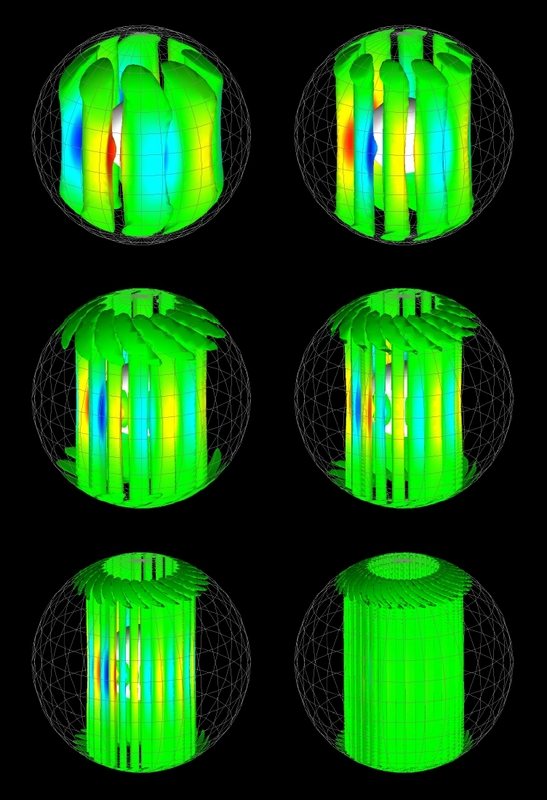 The simulation assumes the Boussinesq equation and the equations are linearised at the onset of convection. 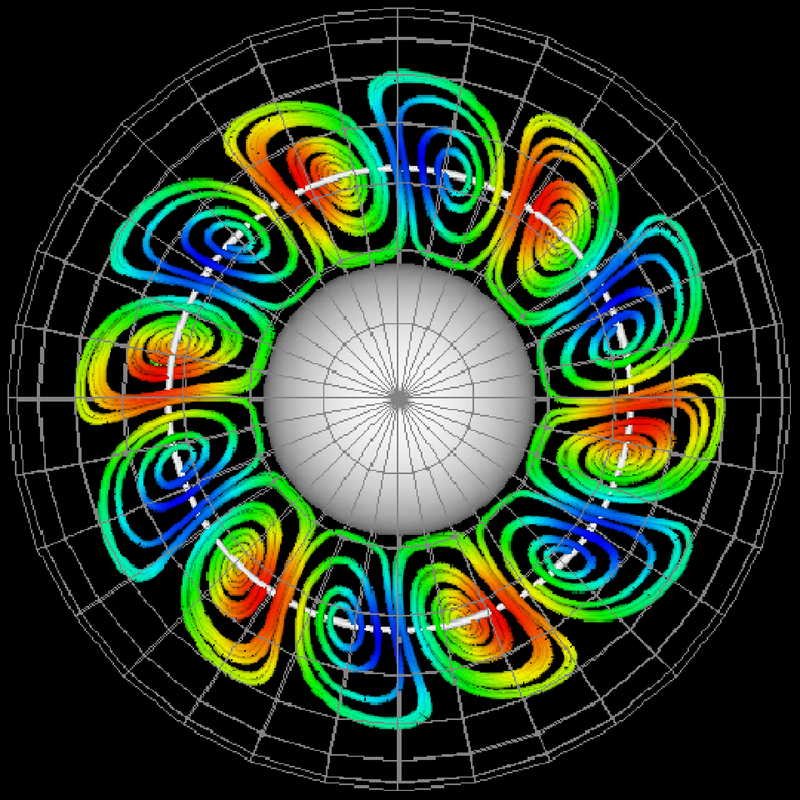 What is plotted: Iso surfaces of the axial component of vorticity, color coded with the temperature perturbation with respect to the steady temperature profile. Ekman boundary layers have been filtered out to enhance readability. Reference: Emmanuel Dormy, Modélisation numérique de la dynamo terrestre, PhD thesis, IPGP, 1997. Description: The onset of convection in a rotating spherical shell at increasing rotation rate (Taylor number 107, 108, 109, 1010, 1011, 1012, from left to right and top to bottom). The convection columns are aligned with the axis of rotation and their number increases with increasing Taylor numbers. 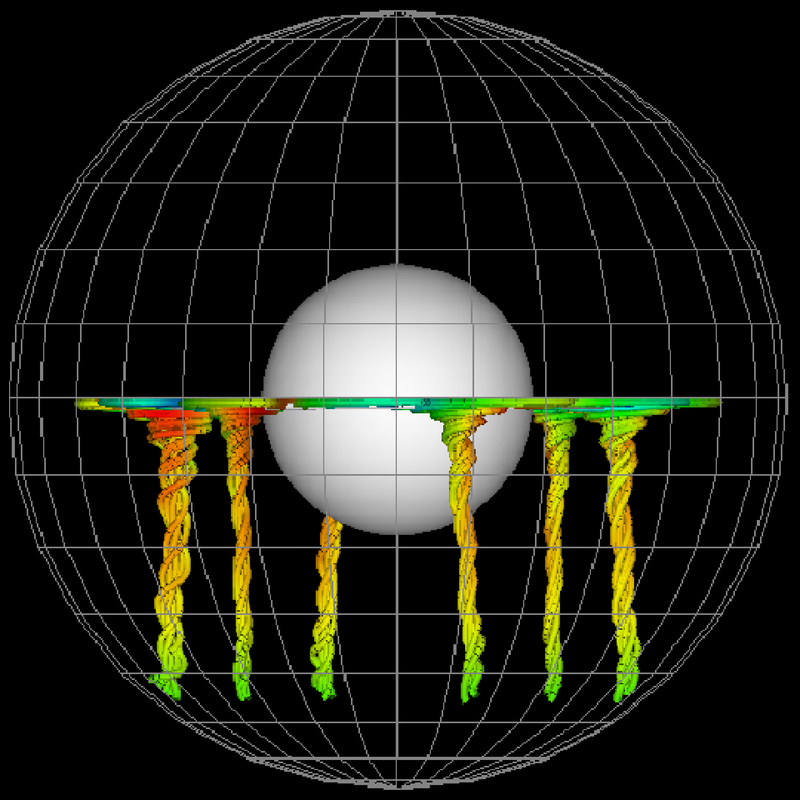 The simulation assumes the Boussinesq equation and the equations are linearised at the onset of convection. A uniform distrubution of heat sources in assumed in the fluid. Ekman boundary layers have been filtered out on the first line to enhance readability. The spherical shell is differentially heated. 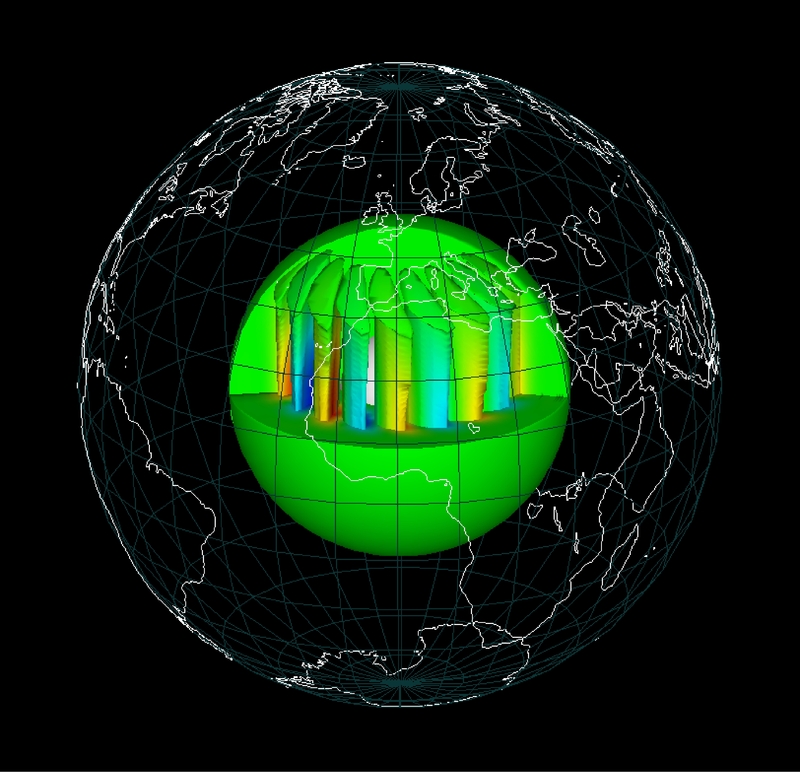 Description: Role of the Prandtl number on the onset of convection (Pr = 7, 1, 1/7, 1/49). As pr decreases the strcture of the mode at the onset of convection approaches that of an equatorial inertial wave. 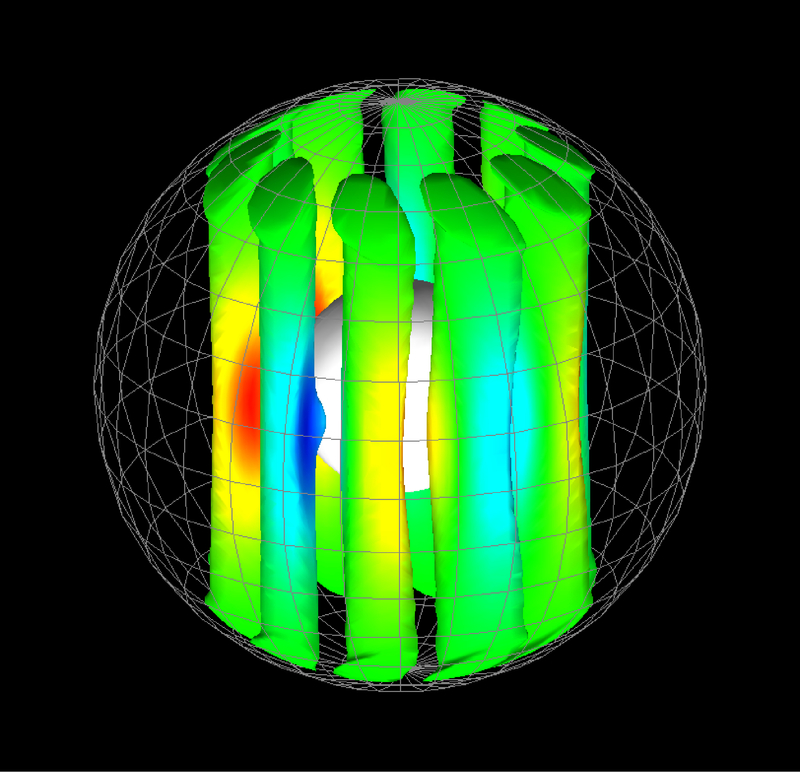 Description: Simulation of convection columns in the Earth core (at moderate forcing, rotation rate and in the absence of magnetic forces). Description: Streamlines for rotation convection at a Taylor number of 108 (Ekman number of 10-4). Linear simulation seen from the side. 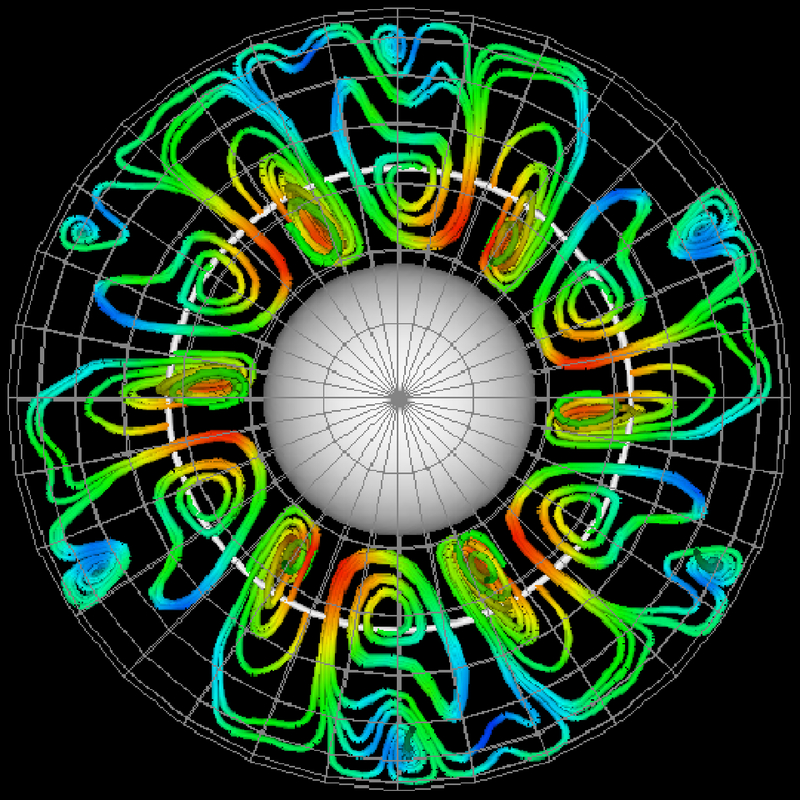 What is plotted: Streamlines color coded with the temperature perturbation (streamlines differ from trajectories, because the flow is drifting and thus not steady). Description: Streamlines for rotation convection at a Taylor number of 108 (Ekman number of 10-4). Linear simulation seen from the top. 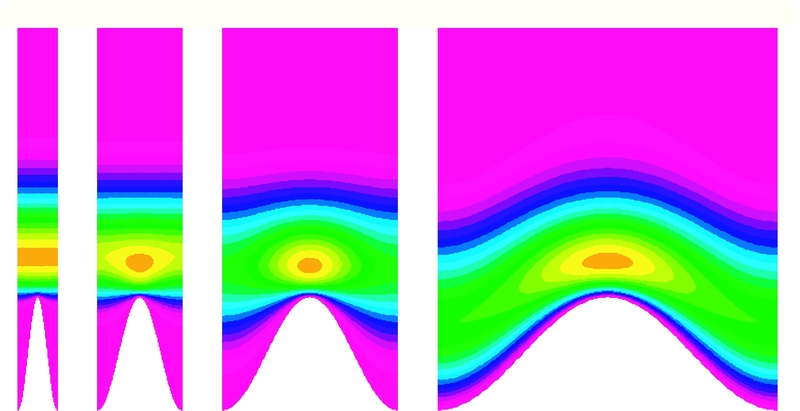 Description: Streamlines for rotation convection at a Taylor number of 108 (Ekman number of 10-4). Non-linear simulation (twice critical) seen from the side. 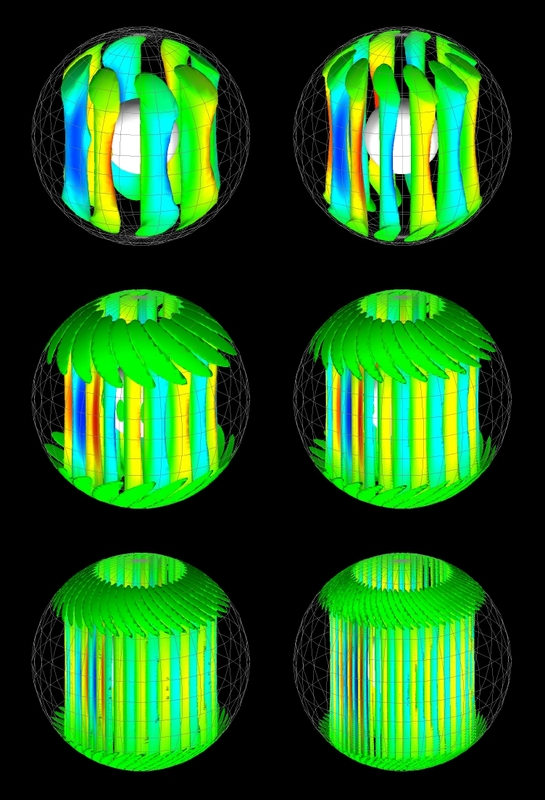 Description: Streamlines for rotation convection at a Taylor number of 108 (Ekman number of 10-4). Non-linear simulation (twice critical) seen from the top. 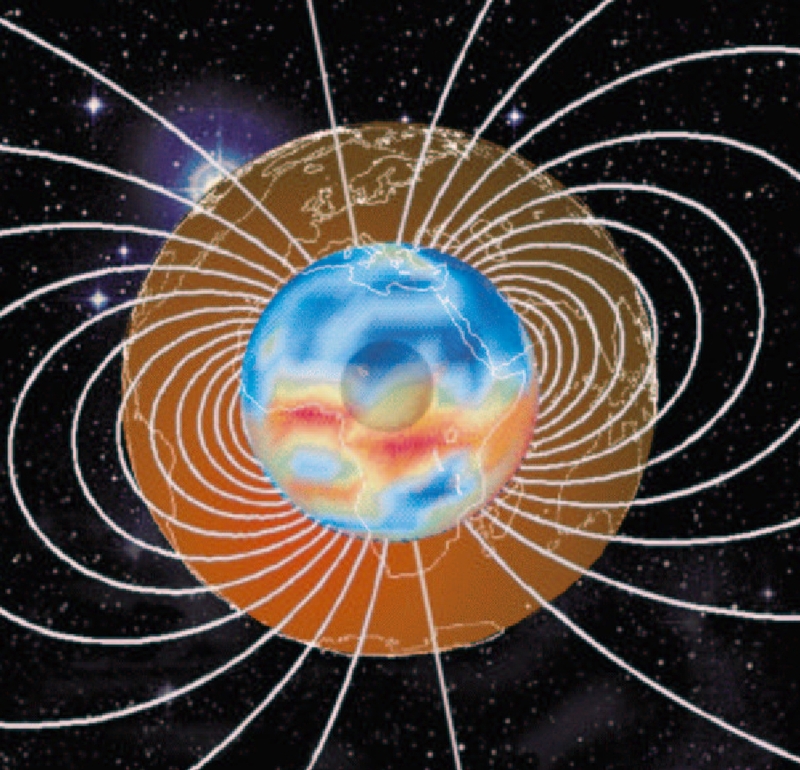 Description: The principal magnetic field of the Earth. 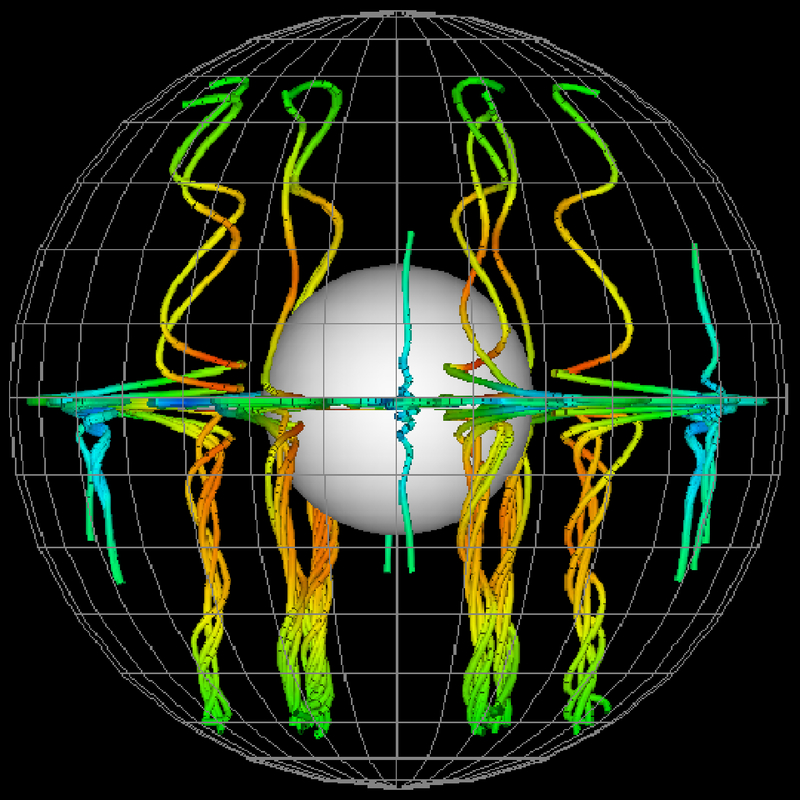 What is plotted: Magnetic field lines of a dipolar manetic field together with the radial component of the Earth magnetic field (in 1980) plotted at the core mantle boundary. Reference: Benoit Desjardins, Emmanuel Dormy, Emmanuel Grenier, Instability of Ekman-Hartmann layers near the Core Mantle Boundary Proceedings of BAIL 2002 International Conference on Boundary and Interior Layers, Perth, Australia. Description: Construction of Ekman layers near a "rough" wall. The Ekman layer follows the boundary until the wavelength of the topography becomes too small, and it then sits on the top of the crests. Paradoxically the dissipation in the boundary layer is lowered it this configuration. What is plotted: The streamwise component of the velocity. Reference: David Gérard-Varet and Emmanuel Dormy, Ekman layers near wavy boundaries Journal of Fluid Mechanics, 565, pages 115-134, 2006.